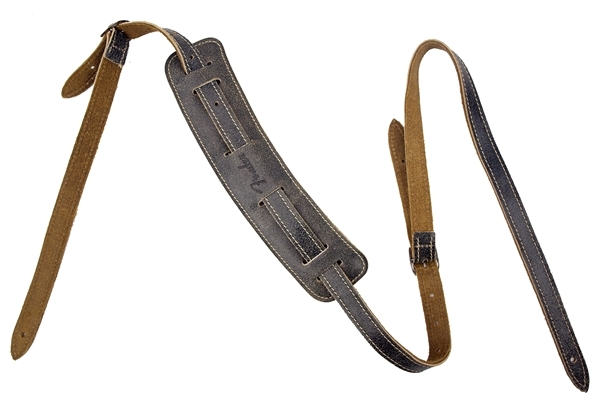 Enjoy luxurious feel and broken-in comfort with this guitar strap that features an appealing worn, aged and distressed look. The 2.5”-wide pad includes a layer of foam padding so you can play all night long without pain or discomfort from a narrow or unpadded strap. The sturdy 5oz. genuine cowhide top leather sports a heavy waxed glaze finish with a natural-looking worn crackled treatment while the backing is crafted from 5oz. cowhide suede leather. The distressed look is complemented by the antiqued double buckle adjustment that will look great on any stage.